Watering tips for the vegetable garden remains one of the most popular questions asked of Master Gardens. Like most garden garden tips, no one answer fits all gardens. Thinking greywater and rain barrels are but a few ways one can think of good watering tips that might fit many types of vegetable gardens. Up first is greywater, or household waste water that is semi-clean, or saying it in an opposite way, water that does not come from toilets or other bacteria laden sources. Greywater systems are popular for recreational vehicle users and residential areas that are confronted with drought. For residential homes, gray water systems can be built into the existing plumbing systems. The system runs household wastewater through a series of three filters and is able to recycle 46% of the home’s water into graywater which is non-potable water that can be used to replenish toilet tanks and provide water for irrigation. A few brief thoughts on recycling water rounds out this water tips review. Many areas with water scarcity due to either short term drought or climatic factors often think water recycling for the garden. Water recycling systems can be as easy as the traditional rain barrel trick. Place a barrel under the roof during the rain, collect the runoff and use it as needed. Of course, if the roof is consistently polluted with heavy metals or other toxic substances, the rain barrel tradition would be more harmful than helpful. All one needs to do is a quick internet search on the available water recycling gadgets on the market. Costs vary according to consumer preferences, and one might be right for any average backyard garden in need of a more consistent water supply. With or without a gray water system, there are some good stand along watering the garden tips. Where once the watering can ranked as the watering tool of choice or gardeners, today sprinklers hold that position. Ease of use explains their popularity. There’s absolutely nothing wrong with making garden tasks easier. Watering Tips: When using a sprinkler, keep in mind a few potential drawbacks. First, sprinklers tend to be less than totally efficient distributing the water. For example, on a windy day, some of the water intended for the garden can be blown away. Depending on the garden soil, a light and consistent layer of water can promote soil crusting, or a hardening of the top of the soil once the layer of moist soil dries. Finally, on windless days, sprinklers can add a layer of water on plant leaves, leaving them more vulnerable to problematic viruses and bacteria. Typically garden experts recommend that the basic salad vegetable garden, one that consists of tomatoes, lettuce, peas, carrots, onions and the like, receive one inch of water per week. That advice often means watering the vegetable garden can be as easy as counting on weekly light summer rains or hauling out the watering can and providing a gentle shower for the plants on a weekly basis. In the garden world, like the real world, a one size fits all answer, does not always fit. Soil and climate conditions, for example, vary from location to location, therefore the one inch rule needs to be understand as a rule of thumb and applied in flexible terms. Common sense reminds us that gardens planted in sandy soils, in hot, dry areas might need a bit more water to effectively deal with the garden’s higher drainage and evaporation levels. The University of Nevada Extension service provided some good advice on the topic of how much and how often should I water the garden in hot, sandy soil climate. How much water your plants need is a question of how deeply and how often to water. How deeply you water depends on the depth of the plant roots. Most vegetable plant roots go down 6 to 12 inches into the soil. However, long-season plants such as tomato, corn, squash and melon, and perennial plants such as asparagus, raspberry and rhubarb can go down as deep as 24 inches or more. Provide enough water to wet the soil to the depth at which most of the roots are found. Watering Tips: In areas prone to extreme dryness where day to day monitoring of the garden is not practical, piling a three inch layer of mulch around the plants helps retain soil moisture. Additionally it keeps down weed growth. On the other hand, gardens planted in clay or loam soils, in cooler climates, might need a bit less water. Checking the look of the soil a couple of inches in depth, at a spot of soil away from the plants can help determine the soil’s moisture content. The University of California Extension Service provided the following advice. Give plants up to 1.5” water/week as needed during hot periods for plants with a spread of 12” or more. During cooler seasons, 3/4” water/week may suffice. For small seeds (planted 3/4” depth or less), immediately after planting the seed, apply from 1/2” to 3/4” of water (in the planting bed) to settle the soil and to start seed germination. For larger seed crops, water a few days prior to seeding, as well as water to a depth of 2 or more inches after planting the seeds. 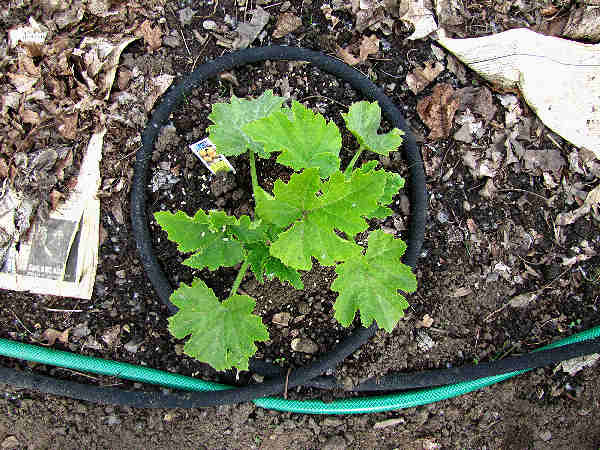 Watering tips: Over watering the garden can be as problematic as under watering the garden. While there exist more than a few over watering symptoms that gardeners use as a check, perhaps the presence of yellowing, droopy leaves during the growing season is the easiest symptom of over watering for the beginning gardener to recognize.